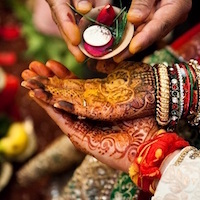 Home / Gallery / Photos / Camera Tips & Tricks / Photography Ideas For Wedding Lehenga! When it's about your wedding, you want to cherish from everything from the tiniest to the grandest moments. You want to make a lot of memories and one thing that definitely helps you accomplish it is photography. The essence and way of photography have changed over times. We don’t only click mainstream photographs with the relatives, but there’s a lot more to it. Just capturing the people in the photographs is not enough these days. Every little thing that adds to your day deserves some love. And when it comes to that, how can you forget your wedding lehenga? If your wedding lehenga is not too gaudy, you can create a fairytale location to shoot your lehenga. A vintage backdrop will also do a magic for your photography ideas for wedding lehenga. Hang exquisite things around like beautiful cages and hang your lehenga, blouse, and dupatta on that. It will look amazingly adorable for sure! All dressed up with all the accessories and makeup, select a location with no crowd around. Pose like a pretty queen, and get the most beautiful shot of the day done! You are going to adore your after you get to see it! The perfect bride! To not let your blouse and dupatta steal all the attention, wear your bright coloured lehenga with a plain white choli/crop top. Go to your roof, twirl and let the beauty unfold. 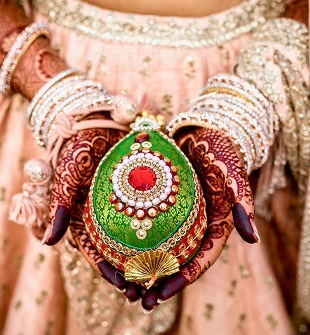 You should definitely try this shot among our photography ideas for wedding lehenga! Create a plain backdrop on any of the walls of your house, hang a vintage frame on it. Put the blouse on the frame, set the lehenga accordingly and if your wedding lehenga has a net dupatta, cover it up so that the design of the blouse and lehenga is pretty much visible and the dupatta just takes away hearts! 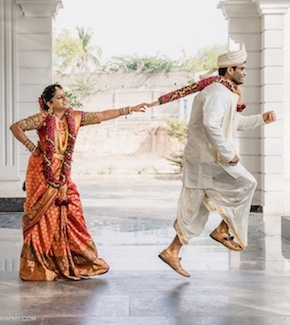 While you do your pre-wedding/ honeymoon shoots, you should take your wedding lehenga along. Or just fix a day for your lehenga. For adorable pictures, your wedding lehenga must be filmed with an exotic backdrop and what better than the outdoors? The best way to show off the radius of your lehenga is to twirl and make your photographer click at the right moment. A flared wedding lehenga can be best photographed like this. Try it out and you are going to love it! A back pose is absolutely necessary. It highlights the back design of your blouse and the way you have tucked in your dupatta. It is also a nice pose to get your hair-do highlighted. All the jewellery gets to hide at the front giving your lehenga to be the only attraction one gets to look at! If your wedding function is an evening event and your wedding lehenga is one of a bright colour and would look much better in the daylight, be it so! Get done with a simple makeup and wear your lehenga at the day time. If your wedding day is going to be super busy you can try it some other day before but you should definitely go for it. It’s totally worth it! Half-do is a photograph taken when you are half done with your wedding look. When the base makeup is done, just add on a piece or two of the accessories and get some pretty pictures clicked without all that ghunghat and covers! Also, you won’t need to do any extra efforts for that! So, gear up and make it a priority to get brilliant clicks of your wedding attire, it’s as special as the day, isn’t it? If you liked our photography ideas for wedding lehenga then like, subscribe, comment and share.